When taking a cross-country road trip in North America, it can be a point of emphasis to stop in small towns. Travelers get a feel for the areas the otherwise would never get to explore. But, this practice is usually overlooked when thinking about traveling abroad. That doesn’t mean foreign travelers don’t have many opportunities. Much like a trip in the United States or Canada, these small towns can often provide more authentic and memorable experiences. One of the most popular tourist attractions in Thailand is Ko Phi Phi, a collection of two islands, the smaller one being Ko Phi Phi Le or Leh. This island is home to a marine national park that features bioluminescent plankton which draws in thousands of tourists a year. The island also possesses some picturesque limestone cliffs and sandy beaches. The island itself is uninhabited, but can be accessed via boat. Wanaka is a resort town located on the South Island of New Zealand and is the gateway to the Southern Alps’ Mount Aspiring National Park. So close to the Alps, it will come as no surprise that Wanaka is surrounded by stunning mountains. But, the town is just as close to glaciers, beaches and lakes to explore. This small resort town is a perfect getaway for outdoor adventure seekers as well as people who enjoy natural beauty. If you don’t want to spend your whole time hiking or camping, Wanaka boasts luxury hotels, fine dining and shopping experiences. Although Mendoza is a capital city, it still very much holds a small town feel. This charming city is known for its views, growing culinary scene, wine, and leisurely pace. Despite a placement on the foothills of the Andes, most tourists flock to Mendoza for its wineries (of which there are hundreds) and olive oil. Due to its location, it is also a popular spot for outdoor adventurists looking to hike, raft, and even ski in the winter. Hogsback, South Africa is a tiny town with a population of just over 1,000, located in the Amathole Mountains. 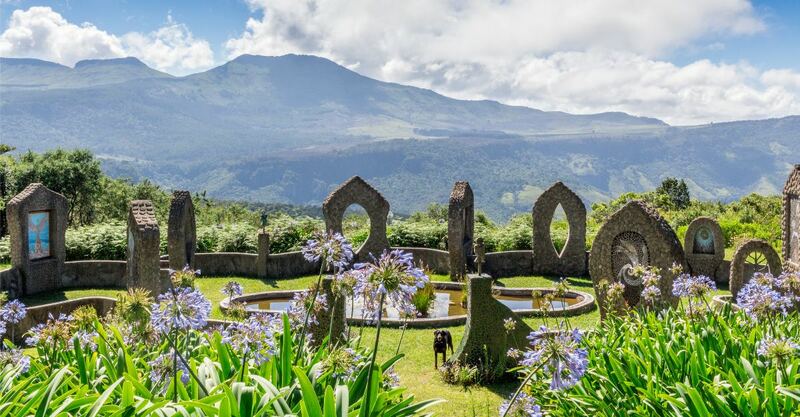 Hogsback is known for its mountains as well as its gardens and waterfalls and is a well-loved spot for hikers. Fantasy enthusiasts also have a famous reason to visit the small South African town. Hogsback is also a popular tourist attraction due to the fact that it is believed that the Amathole forest is what inspired J.R.R. Tolkien’s fictional forest of Mirkwood in The Lord of the Rings. And there is certainly a magical feel in the area to inspire such a setting. No matter where you go in the Faroe Islands, the population will be small and/or sparse. In Gasadalur, this is especially true with the population under 20 people. This small town, located on the western side of Vágar is placed perfectly to enjoy views of the island of Mykines. It is also the home of the waterfall, Mulafossur. The small town lies in a valley that’s home to one of the largest peaks in the Faroe Islands. While it’s a beautiful location, that makes Gasadalur much harder to reach. The steps built into the cliff side leading down to the beach make it accessible by boat. A recently made tunnel does allow for some travel by car, and there’s also an opportunity to hike or helicopter ot the town. Although it’s remote, if you’re looking for a truly small travel experience, this is it. Some of these locations offer disease risks that are new to foreign travelers. This makes travel preparations even more important, including vaccinations. Give us a call at or book an appointment online for any help with vaccine needs. Had you heard of any of these tiny, foreign destinations? Would you consider a stop in any of these small towns? Let us know in the comments, or via Facebook and Twitter.